Never let it be said that I'm not a homer, and this week's high notes will point towards the home team USF Bulls, whose Herd of Thunder shone in a Friday night game (and defeat) against Memphis. They typically find their way into high notes once a season, if for no other reasons than they're good and they're the team I always make an effort to watch. And while their sound was noteworthy, so too were their uniforms. First catching a glimpse of the HOT's new look, I wondered for a moment if I had somehow overlooked a new set that debuted at the beginning of the season. I haven't, after all, watched every minute of every game; is it possible I somehow missed it? Then I remember who I am and concluded there's no way I wouldn't have noticed, and sure enough, Friday night's game was the debut of the Herd's new set, paired with the football team's SoFlo look. I enjoy the tops quite a bit; I didn't have a problem with the old sets, but the white certainly adds some Florida flair, and is probably welcome in the Tampa heat. It was the bottom half of the look that had me exclaiming, "WHAT ARE THOOOSE?!" 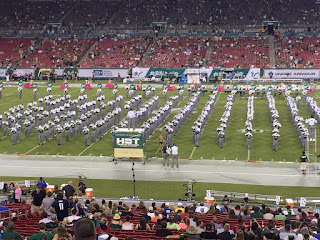 Black pants have been the norm for HOT, and are pretty standard for many bands, particularly in the corps style tradition. 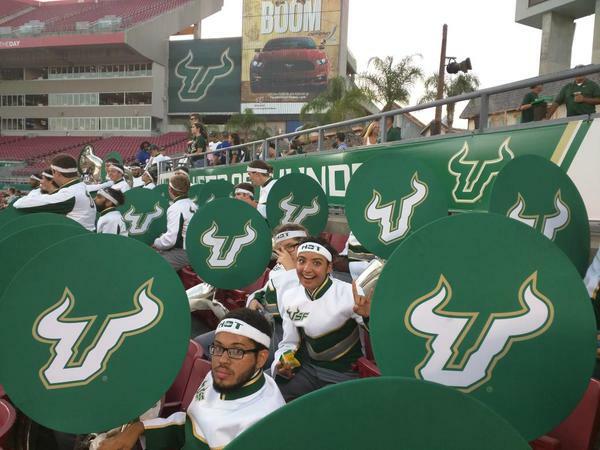 Green would have been a good look for obvious reasons, white would've really popped, and if they wanted to go with the lighter palate but avoid white, USF's gold (tan) would have provided a look I've not seen on many other bands. While gray is neutral by most measures, I find that in this context, it makes gray the overwhelming look, not fading into the background in the manner black or white may. In a vacuum, the look's not bad, but because I want to see my team in green and gold, it throws off the look. I liken it to Blue Stars' gray bibbers; the blue evident in their name is an afterthought. 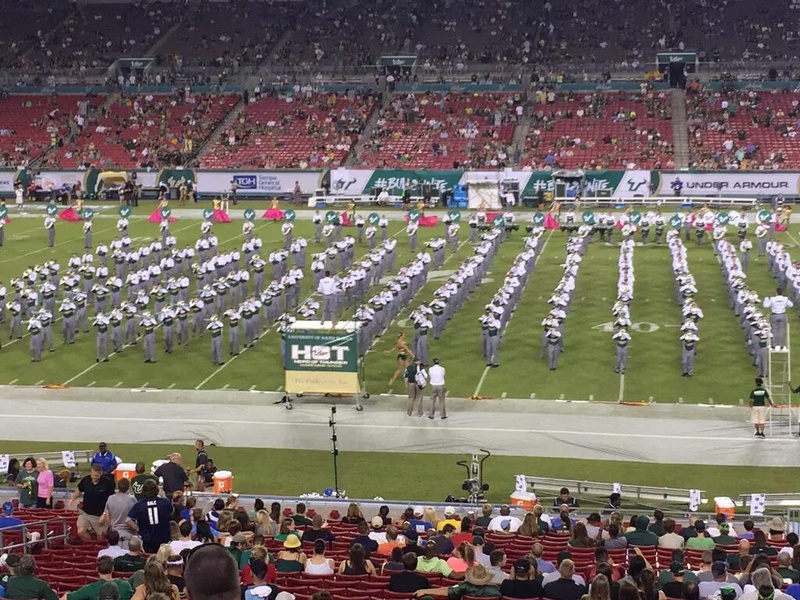 My history affinity has always excused a certain amount of gray for gray's sake for southern programs (See also: Alabama's drum majors, various football uniforms) but looking at these doesn't scream USF to me. Purchasing band uniforms is an expensive proposition, however, so it looks like I'll have plenty of time to get used to our new look.